Esterline CMC Electronics provides its Cockpit 9000 system as an upgrade for C-130 military transport aircraft. Earlier this year, Esterline CMC Electronics (CMC) bought the aerospace-and-defense division of fellow avionics system supplier Barco. Esterline is here in Paris to show off its full line of products, which now includes the former Barco avionics displays as well as its training-and-simulation business. As part of the integration of the two companies, all display-related capabilities are being consolidated into a display-solutions group, which will include engineering, product management and program management for all of Belgium-based Barco’s avionics products as well as CMC’s own line of custom electronics displays and systems. “CMC is now the number one independent supplier of high-quality avionics displays,” said company president Greg Yeldon. “This recent acquisition underscores Esterline’s drive to invest in value-creating technologies for our customers that will contribute to the company’s growth.” The new display-solutions group will offer an extensive array of capabilities, according the manufacturer, including modules and control assemblies, video displays and smart displays as well as avionics and associated software and application services for commercial and defense markets. Here at the show, CMC is highlighting its Cockpit 9000 CNS/ATM (communication, navigation surveillance/air traffic management) upgrade for legacy C-130s and other transports. According to the company, it can extend the life of a 20- to 40-year-old aircraft by another 30 years at a fraction of the cost of a new aircraft. Visitors to the company’s stand (Hall 5 D250), can see a mockup of the integrated, digital cockpit, which is built around the company’s latest-generation CMA-9000 Flight Management System combined with a high-integrity GPS landing system. 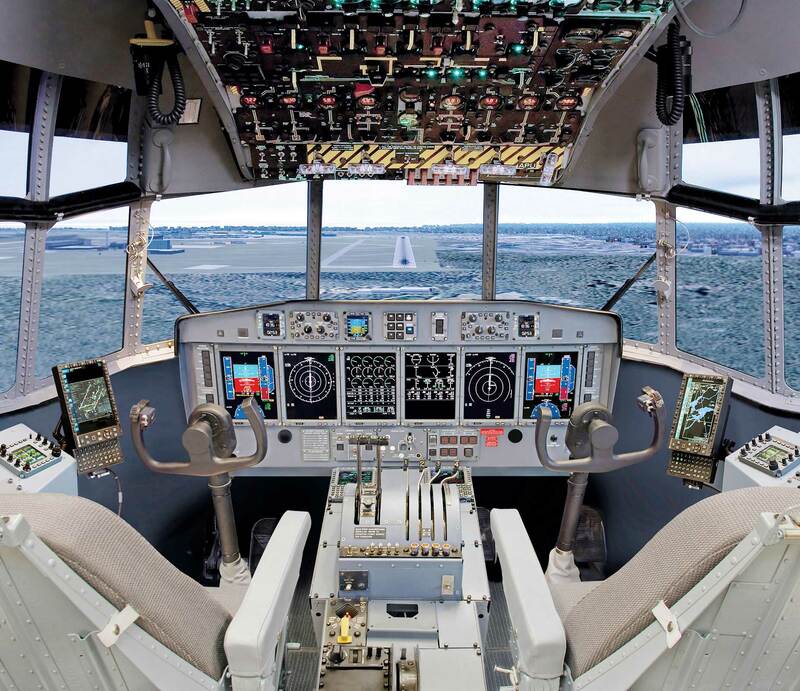 Cockpit 4000 is intended as a solution for all flight phases from departure to approach. It will provide full compliance with published international CNS/ATM navigational mandates and also accommodate growth of future “NextGen” provisions such as: automatic dependent surveillance-broadcast (ADS-B) out; elementary surveillance/enhanced surveillance (ELS/EHSD); precision area navigation (P-RNAV); required navigation performance (RNP) 0.3 and RNP-10; localizer performance with vertical guidance (LPV); and also controller-pilot data link communications (CPDLC or Data Comm) capabilities. The Canada-based company has C-130 cockpit upgrade experience with more than 10 international operators, including Austria, Brazil, Chile, Dubai, the Netherlands and Saudi Arabia. Through the use of its six-display avionics suite, which provides fully integrated tactical capabilities, centralized caution and warning and night vision system compatibility, aircraft mission capabilities are enhanced while maintenance costs are immediately reduced. According to Yeldon, the C-130 upgrade market is still a strong one for CMC’s avionics packages. He said the company also is seeing interest from manufacturers to help equip entry-level military training aircraft. In the field of electronic flight bags, CMC is looking to network these to create more of a network-based application that would marry them up through a network switch to an aircraft’s flight management system. This solution is being implemented for Bombardier’s new CSeries airliners.